Elements of the 4th Infantry Division were stationed at Camp Caldwell (or Caldhell). Army Spc. Nathaniel A. Caldwell of Omaha, Nebraska was responding to a civilian call when his vehicle rolled over in Baghdad, Iraq. Caldwell was assigned to the 404th Air Support Battalion, 4th Infantry Division, Fort Hood, Texas. He died on May 21, 2003. A 4th Infantry Division soldier died while sleeping at a base camp in the town of Kirkush on 08 August 2003. 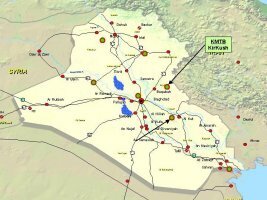 Kirkush is located some 90 km northeast of Baghdad and 20 km from the Iranian border. Kir Kush [Kirkhush, 33°43'10"N 045°17'24"E ] is not a city. Until the US Army arrived, it was an abandoned Iraqi military facility. Construction had begun in the mid-1980s and ceased in the late 1980s or early 1990s. The entire facility covers about 100 acres and has several medium size groups of building called PODs. The main road to KirKush is not paved and has no markings to indicate a highway number or route number. Actually, it is probably not the main road as the convoys take various routes to confuse the enemy. About a kilometer outside of KirKush is a cement factory. The cement factory near KirKush has several smoke stacks that are black and about 50 feet high. Camp Caldwell has a fitness center and barbershop. It also is home to four Morale, Welfare and Recreation rooms with a total of 100 computers and 37 phones. In a unique program, soldiers can purchase CHUNET, a personal wireless Internet service in each CHU for $150 for three months of service. This gives soldiers both more unlimited access to the Internet as well as privacy during usage. However, the regiment's command can still shut down the system at anytime for security reasons. Individual CHUs may also order television satellite dishes for $150 for three months of service. The service offers 15 English channels and 30 channels in total. Soldiers are not permitted to use satellite phones because of the risk of monitoring by insurgent forces. 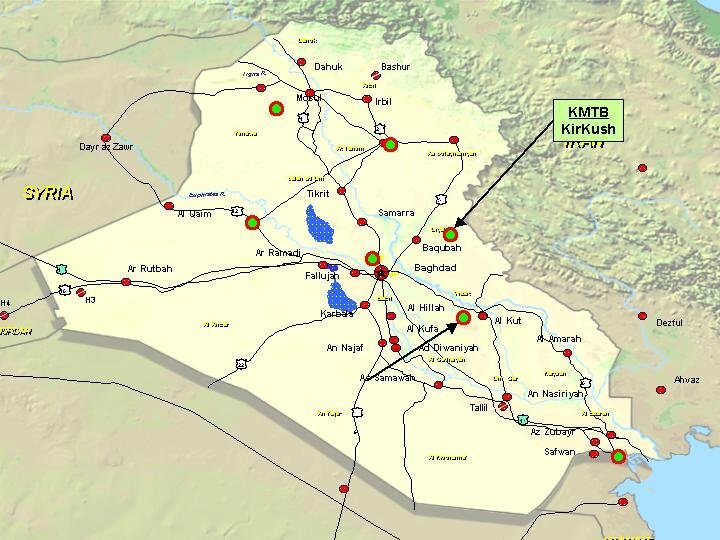 Kirkush Military Training Base (KMTB), Iraq (Mercator Grid Reference System 38SNC 22027 30374) is approximately 70 miles east of Baghdad, close to the Iranian border. Coalition officials are hoping security will improve when a new Iraqi army is formed. 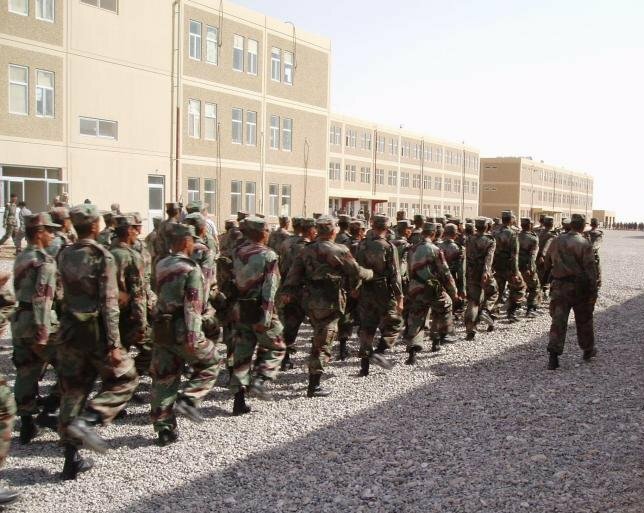 The first battalion of that new army graduated from training on 04 October 2003. Their training camp is near Kirkush, 90 kilometers northest of Baghdad. Some 750 recruits lived and worked at the Kirkush base, a group of squat cement buildings standing in the desert far from the nearest town. The battalion began their 9 week training course on August 2, 2003. During their time in Kirkush, the trainees were instructed in a variety of subjects from the laws of war and codes of conduct to first aid and marksmanship. The first battalion will become part of the U.S. 4th Infantry Division and work along side Coalition forces to protect Iraq's borders. A number of graduates will remain at the training base to become instructors for future battalions of the Iraqi Army. They will continue to receive advanced training focused on their specific mission, once assigned. The training facility, located 130 kilometers northeast of Baghdad in Kirkush, is one of three sites located throughout Iraq that had begun construction by a Yugoslavian company more than a decade ago, prior to the first Persian Gulf War. However, after that conflict, with the onset of United Nations sanctions that curbed Saddam's military build-up, construction stopped. These facilities were left unused, undeveloped, and essentially abandoned for more than ten years. 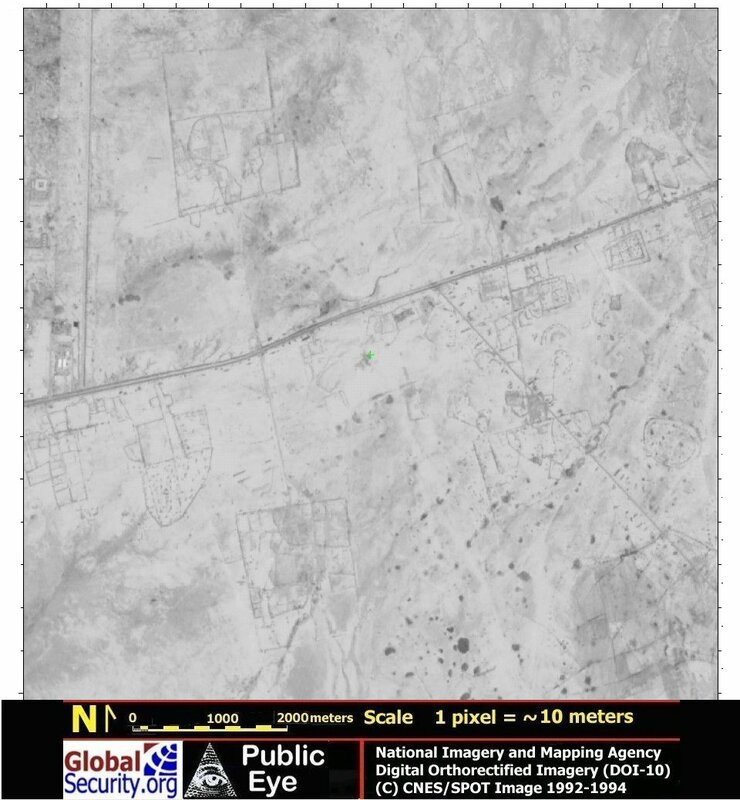 However, since they were still the property of Saddam's government, looting and stealing from these 'ghost-towns' was not a problem -- fear of Saddam kept these unfinished facilities secure. The roughly 4 kilometer square area was designed to accommodate seven battalions worth of soldiers with roughly 200 buildings, which include barracks, kitchens, classrooms, administrative buildings, warehouses, maintenance facilities and everything you would expect at a military base. There is even the outline of foundations for family housing units that were never completed. Once the regime fell and the blanket of fear lifted, many of these building were looted for windows, doors, plumbing and electrical fixtures, or simply vandalized in reprisal against the old regime. Because of the remote location of the facility, and with the lack of water and electrical utility connections from national systems, the Iraqi Contractor, Al Mansoor Construction Company, a state-owned enterprise, solved the needs for essential utility systems for the unfinished facility. Operators were having difficulty getting potable water brought to the site from the nearby town of Balad Ruz, 17 kilometers away. Generators were flown in by IAP, a company that had worked closely with the Corps of Engineers on other emergency response missions, to provide the necessary electricity to the site, especially in a country that is having difficult with their national grid. The pace of the team was important for the facility to be ready to accept the first Iraqi recruits, roughly 700 soldiers (an entire battalion), at the beginning of August 2003 for a nine-week training program. Three thousand more are expected in November 2003. The clock was ticking for Iraq to develop their own security, and ticking faster for the team of Iraqi Engineers and the corps, which needed to provide these facilities for that army. 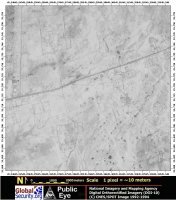 Coalition forces were using the Kirkush facility as a base before it was identified as the first training site for the new Iraqi Army - now they operate as neighbors to the trainees. On one side of the base the US was building these facilities, on the other side were US forces. People you used to think were your enemy were living on one side and you were on the other. It was very much a definite shift of thought. Force protection issues had to be coordinated to allow coalition military operations to continue yet allow access for Iraqi contractors to finish the facilities. Such separation is not entirely unlike stateside arrangements on U.S. facilities where new recruits are isolated from other post activities to enhance their focus to training. The separation helped the trainers maintain a consistent program with the recruits. The training was handled by specialists under contract from the Vinnell Corp., a subsidiary of Northrop Grumman. Vinnell subcontracted most of the Kirkush training to MPRI, an Alexandria firm that helped train the new Croatian and Bosnian armies.